Shop at BHS either in store or online for Fashion, Furniture, Homeware, Wedding Dresses, Bridesmaid Dresses and much more. Shop in store or online at Marks & Spencer for clothing, furniture and homeware, flowers, gifts, wine and much more. 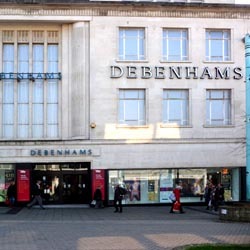 Debenhams is a long established store in the middle of Plymouth selling many of the major clothing brands, accessories, health and beauty products, childrensware and home furnishings.